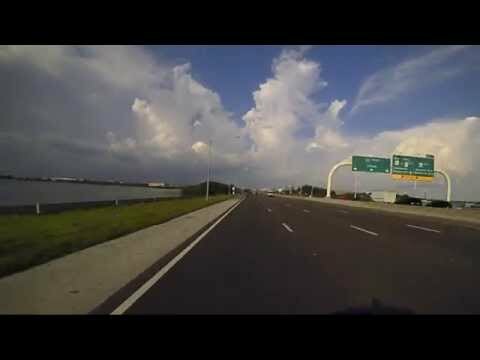 In just 60 seconds this drive takes you across Tampa Bay via the Howard Frankland Bridge (Interstate 275). It starts at the end of the runway for Tampa International Airport, and then heads to St. Petersburg, Florida. You’ll be watching the view from the rear-mounted camera. If you enjoy it, please comment and let me know! Or share it with friends! Copyright Info: This is my original work, and is copyrighted. You may NOT download/reencode/repost. Contact me for commercial use. Exceptions: Broadcast Television use is OK within 7 days of the Youtube publishing date, with on-screen credit and credit in the script. Use in a non-commercial project (such as a school project or report) is allowed.